I never embraced cafeteria food during my primary and secondary school years (and was always baffled by the combination of square pizza slices, corn, and applesauce). 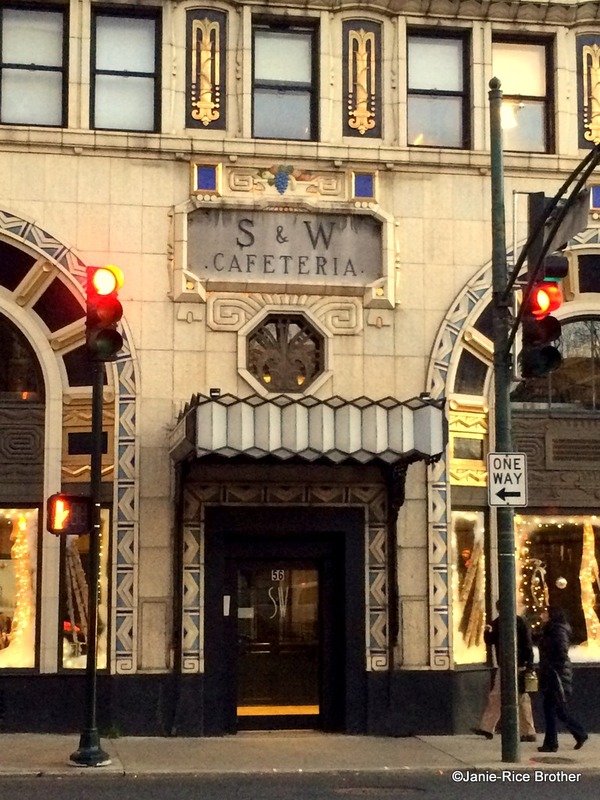 But perhaps the problem was all in the setting – as I stood outside the S&W Cafeteria Building in downtown Asheville, North Carolina – I was quite sure I would devour anything served in such a fabulous Art Deco Building. The Art Deco S&W Cafeteria Building in Asheville, North Carolina. Frank Odell Sherrill and Fred Weber served as mess sergeants in World War I, and upon their return to civilian life, organized the first S&W Cafeteria in 1920 – serving low-cost, southern-style food – in Ivey’s Department Store in Charlotte, North Carolina. The Asheville location opened in 1922, the third location in the state. It quickly outgrew its first home, a leased building on Patton Street, and in 1929, Sherrill (now the sole owner of the company) hired architect Douglas Ellington to design a new building for the cafeteria at the intersection of Haywood and Patton Streets. My photographs can’t begin to do justice to this peacock of a building, resplendent in colored (blue, gold, black, and cream) and gilt-glazed terra cotta. 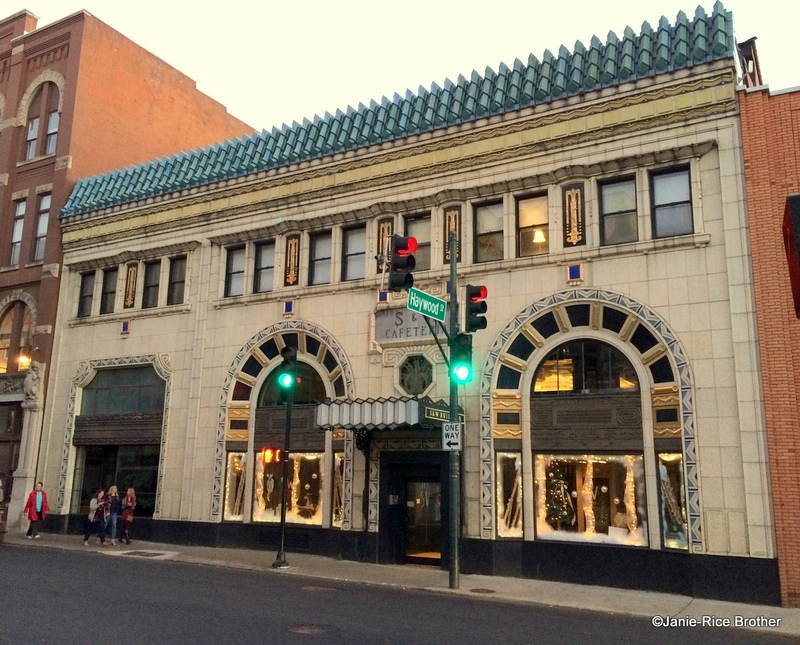 The three-story brick building is faced with thin-cut ashlar stone, and the facade is a brilliant homage to the Art Deco style. The asymmetrical facade has two large arched windows flanking the main entrance, and a third rectangular window accented by concave, fret adorned corners. The top level features paired windows topped with chevrons and stylized triglyphs. A stylized fountain with an octagonal opening is located above the main entrance. The roof, clad in blue terra cotta tiles stacked three to a strip, makes a pronounced statement, capping the dynamic and dazzling design of the facade. The S&W Cafeteria, featuring country-style steak, spoonbread, fried shrimp, and custard pie, remained in this building until 1974, when it joined the nationwide trend and moved to a shopping mall. The building sat empty for a number of years, but was restored and reopened in December 2014 as an event space. Fabulous — both building and write-up!! 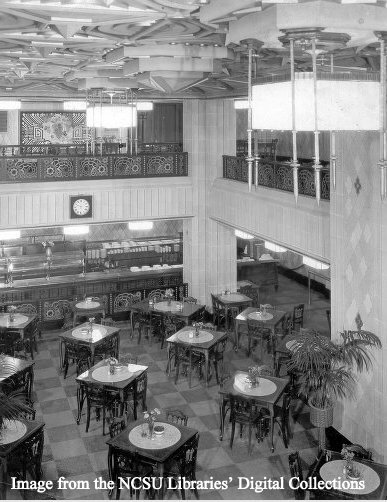 I remember eating at the Blue Boar Cafeteria in Louisville with my grandmother. I think that’s what it was called. Thanks, Although Wikipedia says the last of the Blue Boar chain closed in 2003, there is one list on the web. Have to check it out. We probably went there as children. My parents never missed a Cafeteria. What a beautiful art deco building. Thank you for reminding me. Well, that’s a cafeteria!! Loved seeing it. Thank you. © 2017-2019 Gardens to Gables, all rights reserved.